Plot identical parallel lines at the given positions. positions should be a 1D or 2D array-like object, with each row corresponding to a row or column of lines. 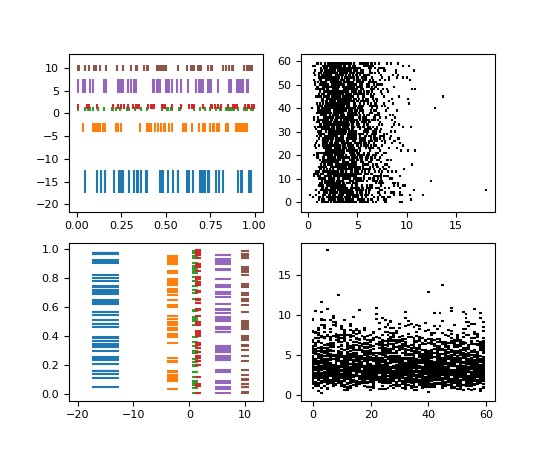 This type of plot is commonly used in neuroscience for representing neural events, where it is usually called a spike raster, dot raster, or raster plot. However, it is useful in any situation where you wish to show the timing or position of multiple sets of discrete events, such as the arrival times of people to a business on each day of the month or the date of hurricanes each year of the last century. Each value is an event. If positions is a 2D array-like, each row corresponds to a row or a column of lines (depending on the orientation parameter). 'horizontal' : the lines are arranged horizontally in rows, and are vertical. 'vertical' : the lines are arranged vertically in columns, and are horizontal. The offset of the center of the lines from the origin, in the direction orthogonal to orientation. The total height of the lines (i.e. the lines stretches from lineoffset - linelength/2 to lineoffset + linelength/2). The line width(s) of the event lines, in points. If it is None, defaults to its rcParams setting. The color(s) of the event lines. If it is None, defaults to its rcParams setting. Other keyword arguments are line collection properties. See LineCollection for a list of the valid properties. list : A list of EventCollection objects. Contains the EventCollection that were added. For linelengths, linewidths, colors, and linestyles, if only a single value is given, that value is applied to all lines. If an array-like is given, it must have the same length as positions, and each value will be applied to the corresponding row of the array. All arguments with the following names: 'colors', 'linelengths', 'lineoffsets', 'linestyles', 'linewidths', 'positions'.